Just when everyone’s attention has been directed toward ISIS and some of the most despicable crimes ever committed, and our government is loathe to war with our planet's unequalled brutality, Jordan’s King Abdullah assumed the role of world leader. Such activity continues to distract us so that we ignore the evils unfolding within our own country – the war of the Moderates who exploit children in incalculable ways. Chechen Muslims, with their violent history, were responsible for the 2004 Beslan school hostage crisis, when they captured 1,200 people (including 777 children), terrorized and raped the hostages. The death toll was 331, including 186 children. Palestinian Muslims have bombed Israeli school buses and built terror tunnels that led to children’s dormitories and classrooms. In America, boys and young men are brainwashed in mosques to join ISIS’s fight for Allah. Schools, such as the Universities of California, have become a hotbed of anti-Semitism not seen since the 1930s. Given a diet of Islamic propaganda in textbooks and videos, the public schools are now “encouraging” and praising Allah (which leads to wearing complete burqas and forced conversion). There is yet another consequence of burqas. In Islam, the idea of modesty is warped into becoming the woman’s shame of her womanhood, which undermines her security and self-respect. This results in an increase in female genital mutilation, and facial disfigurement by acid (already noted in our local upscale shopping mall when a young woman’s face covering slipped). Those who do not wear burqas will be at risk of being raped; the risk in Islamized Sweden and Denmark has reached epidemic proportions, comparable to Islamic countries. The more subjugated the women, the higher the overall crime rate in a tyrannical regime. When news reporters state that we have to defeat the Islamic ideology to win against ISIS, be reminded that we must also defeat the ideology’s permeation into our own lives. Of the 1.3 billion Muslims in the world, it is estimated that up to 25% may be violent extremists, with the majority of Muslims in most Islamic countries favoring Shari’a law. Within the populace are the traumatized, fearful and irrelevant women, as well as the mentally challenged, both invariably disposable and “volunteered” for suicide mission. Another group, a courageous handful who speak out against parts of the Koran and for Islamic reform, has undertaken a daunting and dangerous mission. And finally we have the Moderates, the comparatively discreet in Western society, who go about their daily lives inconspicuously, never speaking out against terrorism, all the while effecting changes in our land in gradual increments. They are the non-violent who nevertheless seek to establish a tyrannical regime here, in America. While citizens are battling the ACLU’s attempt to allow Muslim laws in Oklahoma, a Shari’a court has been established in Texas. New school textbooks are crammed with indoctrinal material about Islam, with little about America and the other major religions, leaving parents in Massachusetts and Florida furious about the deceitful programs inflicted on their children. It is the Moderates who surreptitiously prepare proselytizing films and school excursions to mosques without prior parental notification, all changes that are meant to create a new generation of devotees and jihadists. Only recently, Florida parents exposed to the media the textbooks that contain several chapters on whitewashed Islam, with 100 pages of Judaism and Christianity missing. Moderates are also the college students who, now brazen and empowered by a quiescent, ignorant, leftist administration, defend terrorist organizations, vilify Israel and call for her annihilation, and unite to attack Jewish students. Encouraged to invite outside speakers from terrorist groups (Hamas, the Muslim Brotherhood), the Muslim Student Union (MSU) and Students for Justice in Palestine (SJP) work together to impose their ideology and establish Shari’a laws and restrictions on their host population. 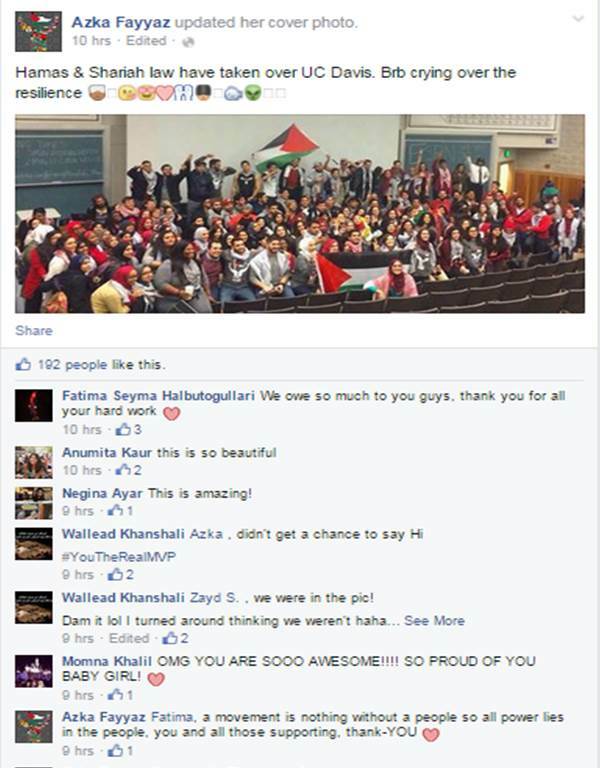 Their leader, Azka Fayyaz, is now openly promoting violence and Israel’s destruction. A dedicated anti-Semite, she announced that Hamas and Shari’a have taken over the University of California, and is no doubt responsible for recent Nazi-style graffiti at a Jewish fraternity and Hillel House. The families that allege to have come to the West in order to escape tyranny reared and nurtured their children in their home culture of intolerance and harshness. These Moderates are fast becoming the jihadists of tomorrow, eager to replace our way of life with theirs. They are the new devotees who celebrate the Islamic Eid with animals that are ruthlessly tortured and slaughtered for sacrifice, and demand particular accommodations from the public schools. They are the bystanders who cheer while non-moderates behead, torch, or throw their fellow human beings off cliffs. They are the ones who happily extend their hands to receive candy distributed on the occasion of a suicide bombing by one of their own. They are the parents of young women who leave home to join a Palestinian cause and become comfort women to Islamo-fascist barbarians, and are ultimately killed. They are the Moderates who believe that every horrific punishment described in the 7th century Qur’an is acceptable today, against homosexuals, women, apostates, infidels, and more.